The What: Midas Touch has introduced the MES-4190, an energy-efficient fan-less embedded PC suited for extreme applications with extended temperature and wide range voltage capability. The What Else: The slim-box PC utilizes an onboard Intel Celeron quad-core processor J1900 to boast both higher performance and lower power consumption. The embedded computer supports system memory up to 8GB with one DDR3L-1066/1333 SO-DIMM socket and offers VGA display outputs. With full-featured of I/O interfaces, the Intel Celeron-based MES-4190 supports one DP-9 for standard RS-232/-422/-485 port, one mini-display port for VGA or HDMI, one Gigabit Ethernet LAN port, and three USB 2.0. 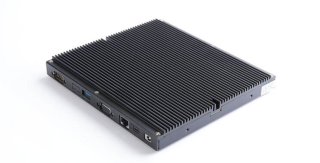 The Bottom Line: Supporting wide operating temperature between minus-10 to plus-50 degrees Celsius, the fan-less embedded PC is suited for wide range of applications. Its passive cooling design also offers quiet operation with low power consumption.